The world is heading towards a rapid disintegration of its economic and financial system due to a "Thermodynamic oil collapse." I spoke with Dr. Louis Arnoux of nGeni, about the details of the thermodynamics of oil depletion and its impact on the global economy. Unfortunately, the world is completely in the dark about this energy information and its dire implications to global economic trade and finance, in a relatively short period of time. During the interview, Louis Arnoux discusses the dynamics of the "Thermodynamic oil decline" using six slides, including one on his nGeni technology towards the end of the interview. The information in this interview is so important, Louis needed to take the extra time to explain these concepts in detail. 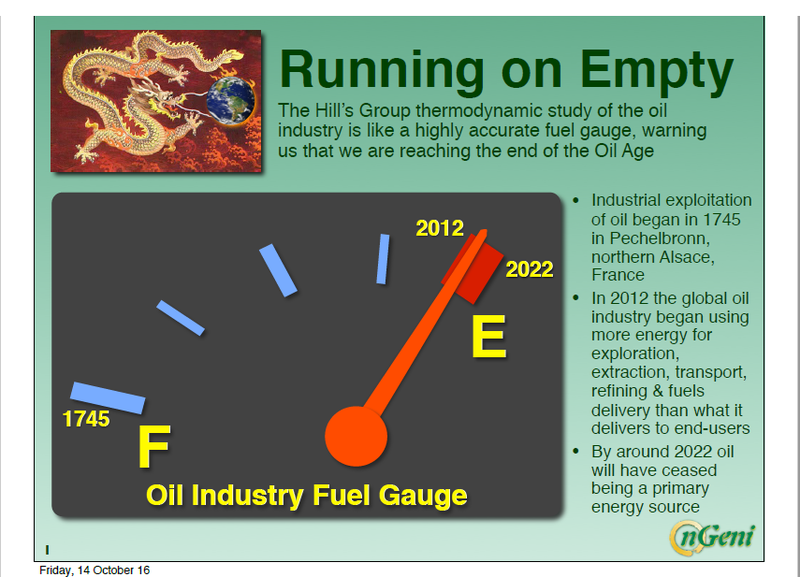 In the beginning of the interview, Louis describes the significance of the first chart showing how the world's fuel gauge is now "Running On Empty." Dr. Louis Arnoux presents his views concerning the depletion of oil reserves, that is, how to best assess depletion, what stage the depletion is at and what this means in financial and economic terms. This is based on his own research and on that of Bedford Hill and his Hill's Group team that he has scrutinised in depth. Dr Arnoux is now part of a team of researchers who have recently refined the Hill's Group work. They are presently preparing a paper to be published in a peer reviewed scientific journal that will present their thermodynamic analysis of the oil industry, the Hill's Group Etp model, how this model enables assessing the depletion status of the global oil reserves, and the high fit of their analysis with empirical data. In the present interview Dr Arnoux is not at liberty to discuss this work as it is not published yet. Instead he explains in lay terms the general dynamics of depletion and focuses on the economic and financial implications for the globalised industrial world of the advanced depletion status of oil reserves. For real GDP or wealth to be created, it must parallel the value of oil and gold. As we can see in the chart above, it does not. 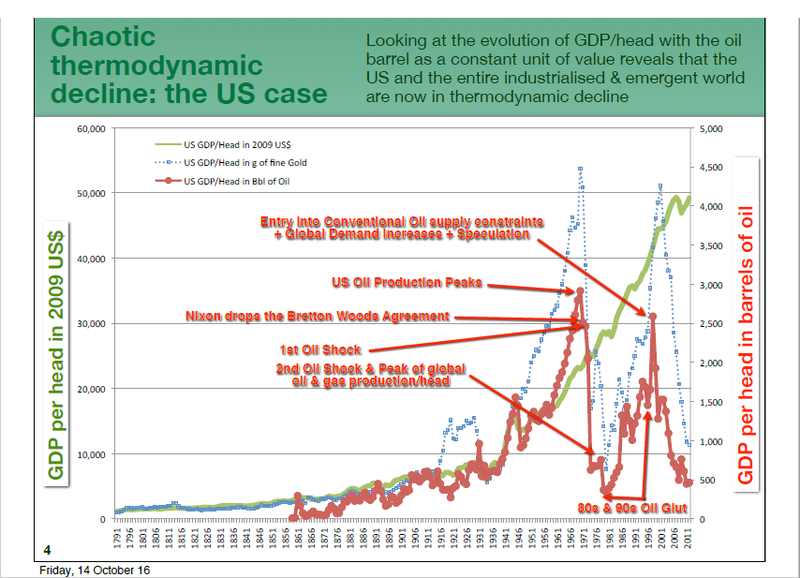 To really understand the significance of this chart, you must watch the Thermodynamic Oil Collapse video above. I imagine there will be many questions and comments about the interview. I plan on doing additional interviews on this subject matter with Dr. Louis Arnoux and Bedford Hill of the The Hills Group, if his schedule permits. Lastly, during my four conversations with Louis Arnoux over the past month, I came to realize just how knowledgeable he was in many fields. Not only is Louis an engineer and scientist, he also understand economics and the value of precious metals as real money. He also believes that fiat money will collapse at some point and we will have to move back to a more sound monetary system including gold. Again, we will discuss this more in upcoming interviews. I would enjoy receiving comments on what you all thought of the information presented in the interview.